Yes, yes, there have been a lot of these featured here at Geeky Gadgets before. But programmer Jeff Rowberg wants to make a difference with his very own Keyglove. Describing himself as “A guy who likes programming,” Jeff has been hard-at-work on his invention for months now. His currently second-stage prototype might not look too hot yet, which is no surprise since he’s going at it all by his lonesome. To date, the Keyglove uses an Arduino platform that allows for touch combinations in lieu of keyboard typing. The Keyglove also doubles as a mouse, thus necessitating an accelerometer. Despite his slow but steady progress, Rowberg has high hopes for his Keyglove. 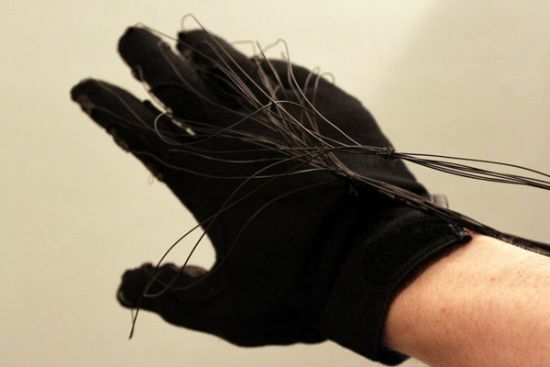 Simply put, by the time he finishes it the Keyglove will out-perform many of its contemporaries, thanks to no less than 34 contact sensors used in tandem with smart controller software. This allows the Keyglove a variety of finger movements to “type” letters. Though trying to picture the jerky movements people will be making with their hands using one of these does score high on peculiarity. Rowberg currently runs an official blog for the Keyglove and if you want a detailed progress report have a look-see at the chart he prepared monitoring the work he’s done so far.